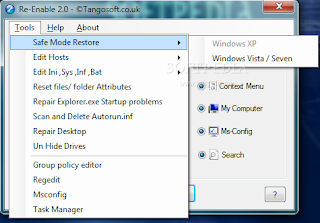 Even after the virus is totally removed from the system, some users find it difficult to restore all those things back which were affected by the virus. A virus usually when enters into a system disables the registryeditor and task manager so that the usercan not remove the virus from the system. An antivirus can remove the virus files but sometimes it may fail to restore the system settings. In such situations this tool can come handy. As you can see in the screenshot, this tool can be used to re-enable registry editor, command prompt, task manager, folder options etc. 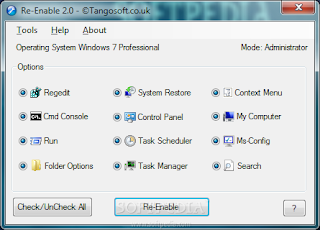 Just select the tools you want to enable and click on the “Re-Enable” button.